England or Scotland? 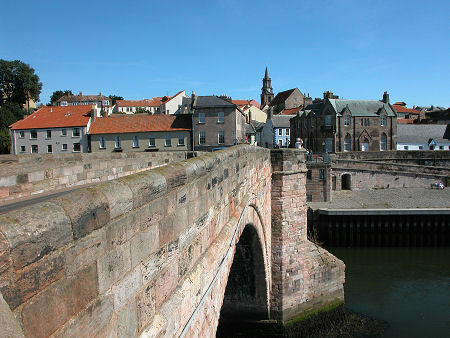 Berwick-upon-Tweed's position on the north bank of the River Tweed, long held to be the nominal border between the two countries, led to the town changing hands no fewer than 14 times in the two centuries up to 1482. Since then it has remained English, so why include it in Undiscovered Scotland? In part because it played such an important part is Scottish history; in part because Berwick Rangers football club plays in the Scottish rather than the English league; in part because it's such a magnificent place to visit; and in part because it nicely rounded off the south eastern corner of our coverage until we took the decision to expand more fully into the English Borders. Even Edward IV's final capture of the town in 1482 didn't entirely simplify matters. 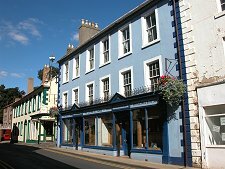 Under the Treaty of Perpetual Peace between Henry VII of England and James IV of Scotland in 1502 (just 11 years before the Scottish army and nobility was destroyed by the English at the Battle of Flodden) Berwick was given a special status as being "of" the Kingdom of England but not "in" it. 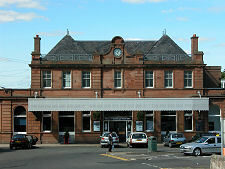 As a result the town thereafter needed special mention in royal proclamations. This had one odd effect. When Queen Victoria signed the declaration of war on Russia in 1853, she did so in the name of "Victoria, Queen of Great Britain, Ireland, Berwick-upon-Tweed and the British Dominions beyond the sea." But Berwick was not mentioned in the Treaty of Paris that concluded the Crimean War in 1856, leaving the town technically still at war with Russia. A peace treaty was only finally signed by a Russian diplomat and the the Mayor of Berwick in 1966. As the mayor said at the time: "You can tell the Russian people that they can now sleep peacefully in their beds". 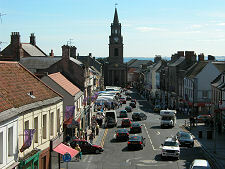 Berwick's early story was as one of the most important towns and ports in Scotland for a period of 250 years from 1018. 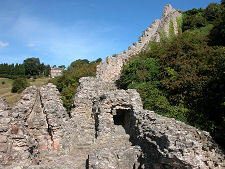 But in 1296 Edward I of England sacked the town and slaughtered 8,000 of its residents. This marked the start of two centuries during which Berwick changed hands between Scots and English on average every 15 years. 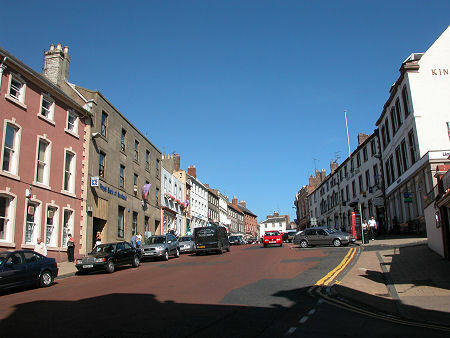 This was not an environment that encouraged business to flourish and the town's fortunes inevitably waned as a result. 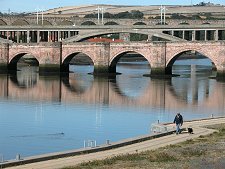 Berwick's story over its past five hundred years as an outpost of England on the "wrong" bank of the River Tweed can be told in terms of its links across the river to the rest of the country. 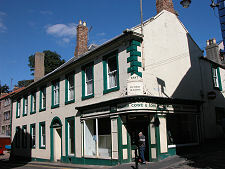 The "Old Bridge" across the Tweed that survives today was the fifth on the site. The first was lost in a flood in 1199; the second destroyed by the English in 1216; and the third was lost to another flood in 1294. A fourth wooden bridge built in 1376 served for well over two hundred years. It may have been in the need of constant repair and patching, but it survived and accomplished its purpose. When James VI of Scotland and I of England passed through Berwick in 1603 en route to claim his English throne in London, he commented unfavourably on the state of the wooden bridge. 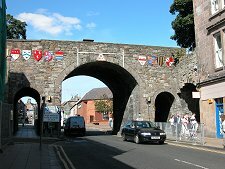 Work started in 1611 on the stone "Old Bridge", which was finished in 1624. This remained the only road bridge over the Tweed until the building of the neighbouring New Bridge in 1928. 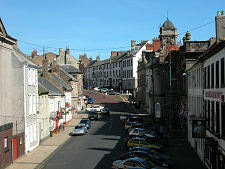 Since 1984 the A1 and its traffic have bypassed Berwick-upon-Tweed over an even newer bridge several miles to the west. 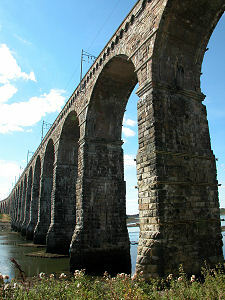 The most spectacular of the Tweed Bridges is the Royal Border Bridge, which carries the East Coast Main Line railway on 28 arches 38m above the river. 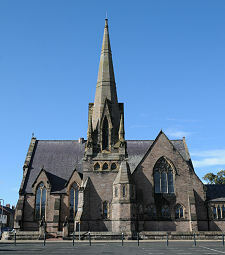 This cost £253,000 to build and was opened by Queen Victoria on 29 August 1850. Apart from its bridges, Berwick's most distinctive feature is the almost intact town wall that still surrounds most of it. This started life early in the town's history, but the massively impressive artillery bastions on view today were begun on the orders of Marie de Guise in 1558 and completed over the following 20 years, mostly during the reign of Queen Elizabeth I. 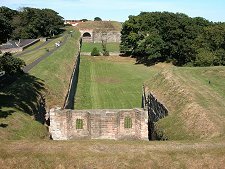 A walk around the walls takes around 45 minutes and gives an excellent series of views into Berwick itself as well as of the River Tweed, the bridges and the surrounding countryside. 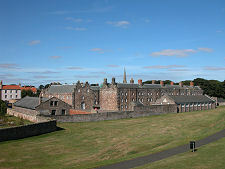 Also well worth visiting are Berwick Barracks, built following the 1715 Jacobite uprising to house a defensive garrison. 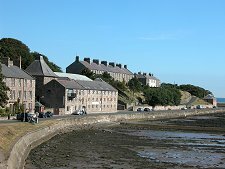 The barracks are now in the care of English Heritage, and are home to three museums, including the King's Own Scottish Borderers Museum and Berwick Borough Museum. 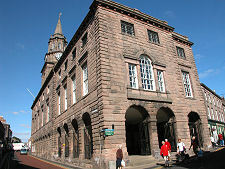 Berwick-upon-Tweed is a fascinating town and a beautiful one, and a stop here should be on the itinerary of anyone making their way to Scotland up the east coast. Don't make the all-too-easy mistake of sticking to the A1 bypass and missing the town entirely. Read about Thomas D. Murphy's visit to Berwick-upon-Tweed in his 1908 book, British Highways and Byways From a Motor Car.